The Propaganda Ministry is pleased to announce that German arms have won a great victory for the Reich. 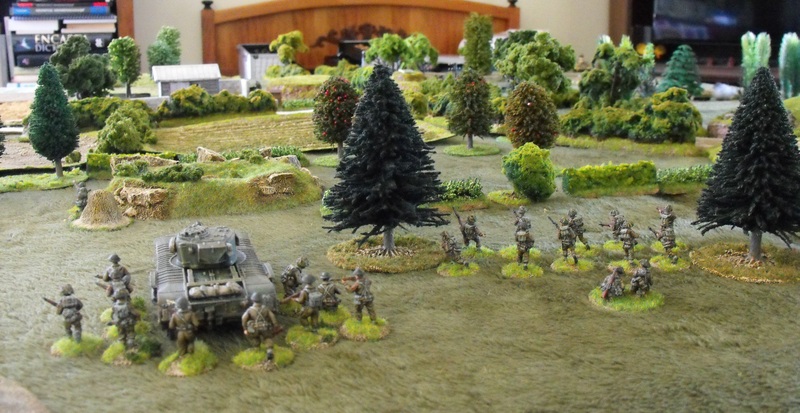 I was going to write further about my 15mm Napoleonics but recently my old friend John, of Jacksarge’s Wargames Ramblings fame, came over for a game of “Battlegroup Overlord”. It had been quite a while since either of us had played any WWII games, in my case over a year. So it was an instance of relearning the rules all over again. It was to prove a long, slow task for the permanently befuddled. Despite that, it was all good fun. 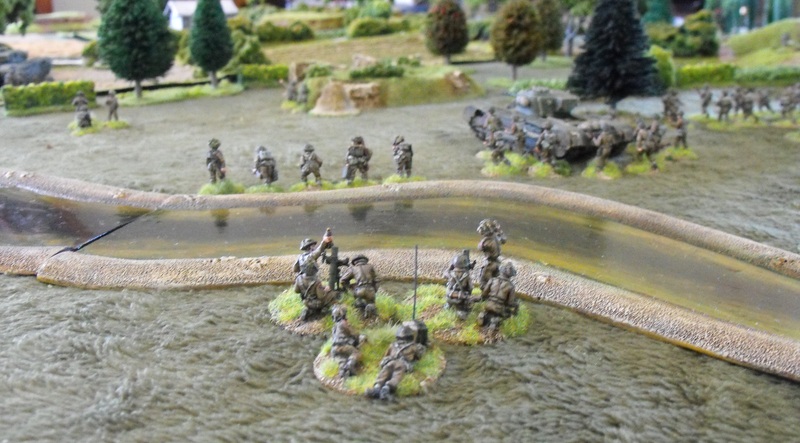 Operations started well for John’s British as they had the most reconnaissance units and out scouted the Germans. 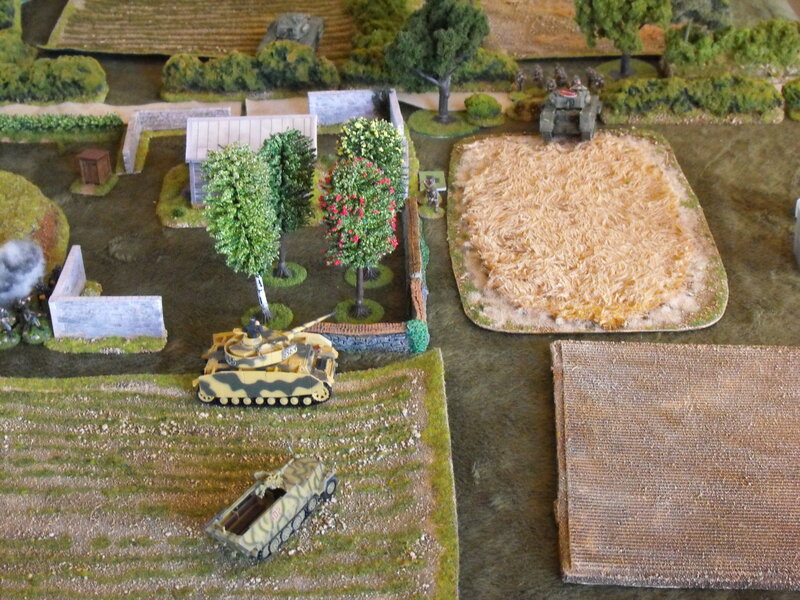 They quickly occupied the two closest objectives and proceeded to use their mortars to inhibit the initial German deployment and pinned the lone Puma that had seized an objective located within an old German defence work. Fortunately, due to John’s woefully poor dice rolls, the British shelling achieved very little. 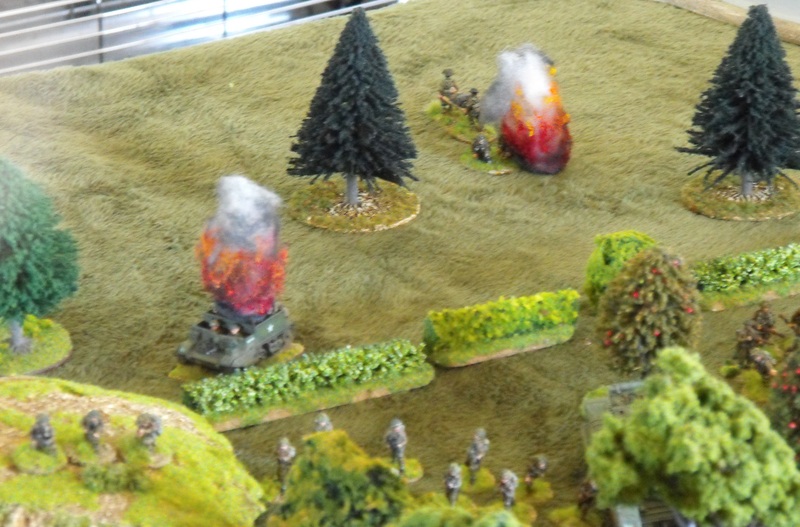 However the German response did a surprising amount of damage even though their mortar shells went wildly off target. It certainly made the British scatter. The Germans speedily deployed from their hanomags, occupied a second objective and formed a defensive perimeter. The most interesting encounter of the entire game occurred when my lone Panzer IV was unable to get a clear shot at a Churchill. 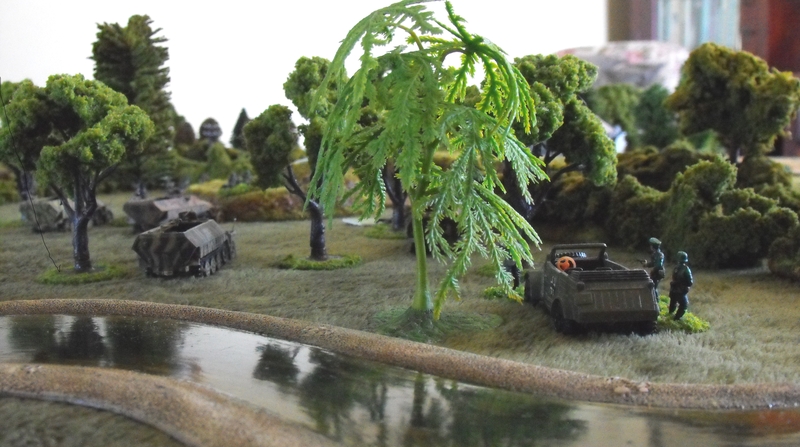 My command hanomag, equipped with a 37mm gun, was sent forward in hope of a lucky shot to destroy the Churchill. The shot completely failed to penetrate but still managed to disable the tank when I rolled a double one on the dice (snake eyes). This was a situation that we hadn’t encountered before. Sadly the hanomag was blown up by return fire. After some hours of gaming, and despite a leisurely lunch, both of us were quite fatigued (neither of us being young men any more), so called it quits. We totalled the chits drawn during the game and found that John’s British were ahead by 5 points; however our forces were both a long way from their break points. In reality the game could have gone either way if we had kept playing but the Propaganda Ministry is claiming it as a victory. I took photos of the game in progress but due to my extremely limited photography skills only a few were worth putting on the blog. 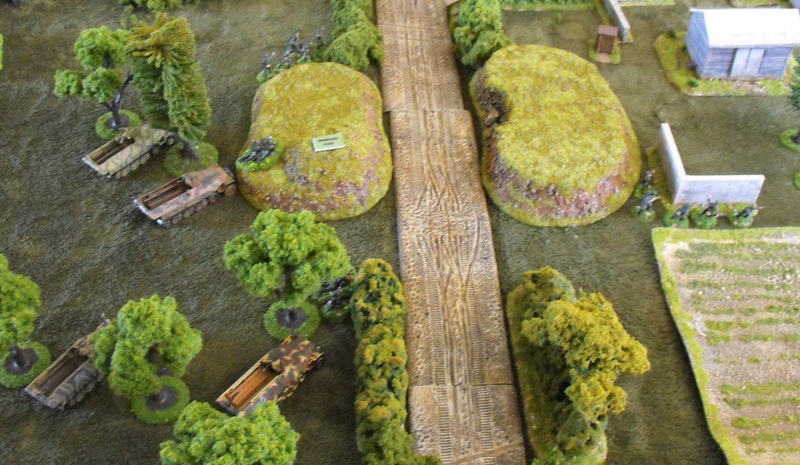 John also took some photos and can be viewed on his blog Jacksarge’s Wargames Ramblings . 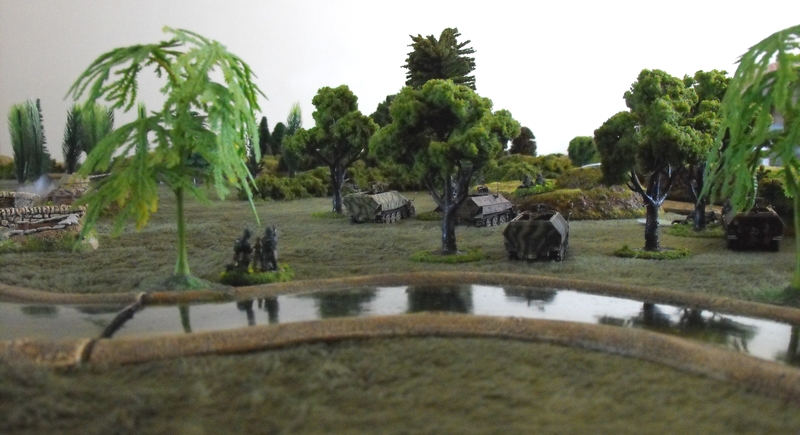 A view from the British deployment zone. The British begin moving out from their deployment zone. A view of the German deployment zone. The kubelwagen, on the right, is a vintage diecast from my childhood wars, while the two Matchbox figures beside it are also veterans of those same wars. German mortar fire went wide but still inflicted serious casualties. The Germans rapidly deployed from their hanomags. 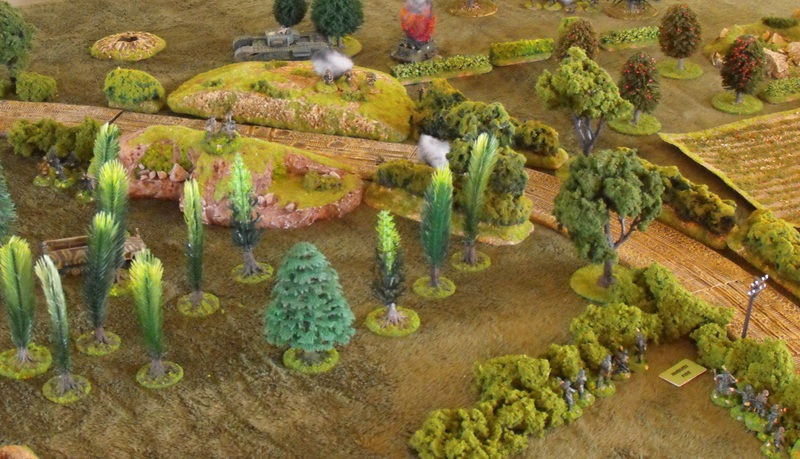 The Germans using the cover of the bocage formed an effective perimeter. The command hanomag takes on a Churchill.